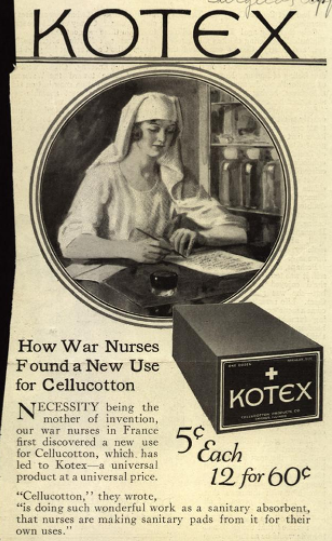 “How War Nurses Found a New Use for Cellucotton,” Kotex, 1921. Kotex promoted the first widely available disposable pads in magazine advertisements by associating them with nurses and war work. These pads were made of “cellucotton,” a synthetic material made from processed wood, similar to bandages used in hospitals. The cellucotton was more absorbent than cotton rags and could be thrown away after each use.